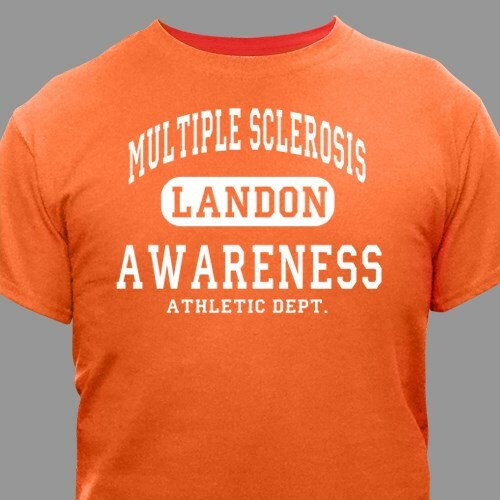 This Multiple Sclerosis awareness athletic dept. shirt lets you show your support for MS awareness wherever you go. Our MS t-shirts are also great for any Multiple Sclerosis Walk Event where you can show your support and help raise awareness. Our Personalized MS Awareness Shirt is available on our 100% cotton shirts, machine washable in youth sizes XS-L and adult sizes S-3XL. Includes FREE Personalization! Personalized your MS Athletic Dept. Shirt with any name on the front. Very happy with the quality and true fit of the T-Shirts. They made our walk participation day even more special. So pleased with my order, the print was perfect & the color was very bright just what I wanted! Very pleased with everything about this T-Shirt Bright Color & print was perfect! Great Price too! So Pleased with the Team T-Shirt, Color is bright & Print is perfect & clear. Always pleased with my order of T-Shirts from this Co. Bright color & perfect Print! Additional Info Multiple Sclerosis affects approximately 400,000 people in the US and an estimated 2.5 million worldwide. By showing awareness, you will help support MS and also help fund research for a cure. Wear this Personalized M.S. Team Walk T-Shirt or our Personalized M.S. Team Walk Sweatshirt at your next Multiple Sclerosis Walk Event and be sure to bring along our Personalized I Wear Orange MS Hat to show your community who you are walking for. For all your Personalized Multiple Sclerosis Walk Apparel and Gear, shop MyWalkGear.com today.